MaxLabs US, designer and marketer of IMPRESS! Dietary Supplement for Men, officially announces Cereboost™ from Naturex (Avignon, France) has been selected as one of the major branded ingredients in their new high-potency "crossover" supplement to keep men "Sharp & Energized Today," "Impressive Tonight" and "Clear Tomorrow." IMPRESS!® Dietary Supplement for Men disrupts the world of nootropics and "smart drugs," largely by including Naturex Cereboost® in the innovative U.S. Pat. Pend. Formula. 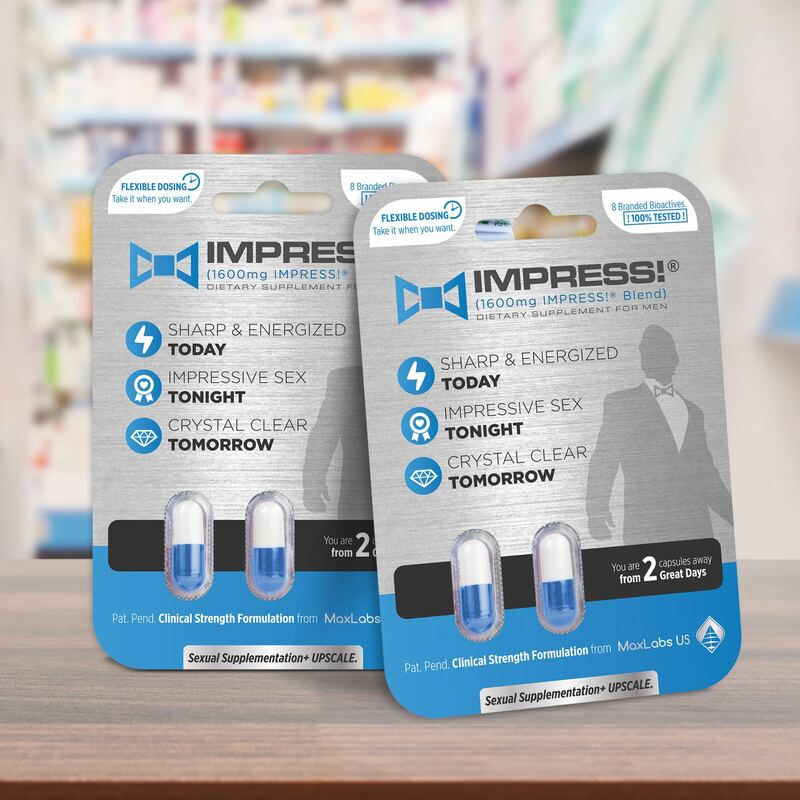 Many discussions about IMPRESS!® are centered on its traditional "male enhancement" and athletic performance properties, but its support of brain and cognitive performance are equally important. Men often take multiple supplements - some for energy, physical performance and "nootropics" for mental agility and alertness. Cereboost® is a superior nootropic choice that helps IMPRESS!® keep men "Sharp & Energized." The "nootropic" category is largely served by ingredients not well-suited to the lifestyle of our customers seeking energy and clarity. Prescription CNS stimulants like Armodafinil vs. Modafinil have many side effects. Over-the-counter nootropic options consist of synthetics like Adrafinil, Noopept and Phenylpiracetam, while Huperzine-A and Bacopa have been popular herbal nootropics. Unlike Cereboost®; Huperzine-A and Bacopa lacked sufficient evidence to earn a place in the "Sharp & Energized" portion of our formula. Data on Huperzine-A and Bacopa as "cognitive enhancers" is largely based on rodent studies or long term use in the elderly or those with head injuries - hardly convincing. Compare this to the randomized, double-blind, placebo-controlled, and crossover study that determined Cereboost® improves cognitive performance in healthy individuals. Additionally, many of the old nootropics are banned from sport by WADA or have been discontinued in other countries. There is additional value in the fact Health Canada has granted Cereboost® important cognitive health claims for support of cognitive function, cognitive performance and working memory. Documented performance, an excellent safety profile and suitability for competitive athletes are nootropic characteristics that truly IMPRESS!®. We are honored to collaborate with Naturex on this new concept for men that's a safe, fun and enjoyable addition to their lives. We're thrilled to see Cereboost® incorporated in this high-performance combination product designed specifically for men. Clinically proven to enhance working memory and attention, Cereboost® was the perfect match for IMPRESS!®, providing just the right action to keep men feeling awake, alert and sharp. We know how seriously MaxLabs US takes its mission of providing effective quality dietary supplements that go the extra mile, and we're honored to have them put their reputation behind our ingredient. Randomized, double-blind, placebo-controlled, crossover studies were conducted to test the efficacy of Cereboost®. The results clearly demonstrate that 200 mg of supplementation with Cereboost® significantly increases working memory and supports attention. Carefully selected by Naturex, Cereboost® is obtained by a patented process from high quality American ginseng, and is subjected to rigorous ID testing to guarantee its authenticity. Its specific and unique profile in ginsenosides ensures its action and efficacy. MaxLabs US designs and markets premium quality nutraceutical products for human use. With a business model built on Innovation, Quality & Value, the company is led by a core team possessing over 75 years of collective experience in business leadership, healthcare and medical devices. The new company is focused on quickly establishing dominance over direct competitors and expanding its portfolio based on market needs. Design, quality assurance, testing, manufacturing and packaging of MaxLabs US products are proudly U.S.-based. MaxLabs US is headquartered in Washington, MI USA. Naturex sources, manufactures and markets natural specialty ingredients for the food, health and cosmetic industries. As the Natural Maker, the company actively supports the global shift to natural by directly addressing key consumer expectations through an offer built on two main focus areas: My Natural Food and My Natural Selfcare. Naturex's portfolio includes colors, antioxidants, specialty fruits & vegetables, phytoactives, and numerous other plant-based natural ingredients, designed to help its customers create healthy, authentic and effective products. The Group's strong commitment to sustainability, continuous innovation process, and the talent of its people are at the heart of its success. Headquartered in Avignon, France, Naturex has experienced steadily-increasing growth throughout the last 20 years. The group posted €397.8 million in sales in 2015 and employs 1,700 people worldwide. Naturex is listed on Euronext Paris, Compartment B – Index: Euronext Next 150, Enternext CAC PEA-PME 150, CAC Small & Mid, CAC Small, Gaïa - Ticker: NRX - Reuters: NATU.PA - Bloomberg: NRX:FP - DR SYMBOL: NTUXY. These statements have not been evaluated by the U.S. Food and Drug Administration (FDA). These products are not intended to diagnose, cure, treat or prevent any disease.